By Committee for a Workers’ International. Abridged version of a full perspectives document to be found here. New Zealand employers are seeking to maintain their profits by increasing productivity. In most cases this means people working harder and faster for less money and fewer conditions. Very little is being invested by employers into research and development. For example, in 2011 only 17% of businesses with 100 or more employees invested in research and development (R&D). Of the businesses with 50-99 employees only 13% of businesses invested, while just 10% of businesses with 20-49 employees put funds towards R&D. 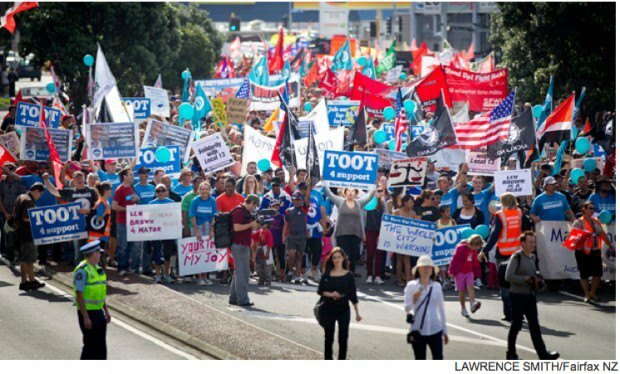 New Zealand employers prefer to continue their efforts intensifying the exploitation of the working class. Since the onset of the crisis, employers lobbied the National government for industrial law changes which have been passed, including the implementation of 90-day work trial periods without rights to grievances for unjustified dismissal, the narrowing of the interpretation of unjustified dismissal, and the narrowing of prospects for reinstatement where a dismissal is held to be unjustified. Such measures are designed to make labour more flexible for employers and to further discipline working people for the employers’ needs. Other changes, such as enabling the employer to require a medical certificate for only one day of sick leave (previously employers were only able to require proof on the third consecutive day), have the stated aim of improving productivity. They are also about increasing employer control over the workforce. A range of changes have encroached more directly on union rights such as the tightening up of union right of entry to workplaces. This is now only with the permission of the employer and the burden placed on unions to prove an employer is being unreasonable by denying access. The reintroduction of youth rates – “starting out” rates – will not impact on worksites where unions, notably Unite and FIRST Union, have written youth wages out of union agreements but it will increase the exploitation of thousands of young workers in unorganised workplaces. The government also changed the review process for the adult minimum wage by limiting consultation to only the Council of Trade Unions and Business New Zealand. It has narrowed the factors that should be considered in the annual reviews by excluding social factors and wage relativity factors. This is an attempt to send a clear message out against sections of the union movement, like Unite Union and the Service and Food Workers Union (SFWU), which have run Living Wage campaigns. Firstly Unite ran a campaign to have the minimum wage to be indexed at 2/3rds of the average wage, with an immediate increase to $15 per hour. Next, the SFWU has lead a public campaign which has got traction for a living wage which would allow for a decent standard of living and the ability for ordinary people to properly participate in their communities. Due to the pressure of these campaigns both Labour and the Greens have accepted the need for a $15 minimum wage. If they do come to power in 2014 the claim for $15 which Unite pushed in the 2009 to 2010 period will be less relevant. Workers have moved on from the $15 per hour demand and organised low paid workers are now looking for considerably more. If Labour and the Greens take power they may make some minor changes to the minimum wage, but against the backdrop of a fragile economic situation they will be under intense pressure from employers to ensure these changes are mere window dressing and that there are various factors that would allow employers to opt out. The only way a real living wage will be won will be via a union-led industrial campaign. At an institutional level, the government has made the major change of merging the Department of Labour, the Department of Building and Housing, the Ministry of Science and Innovation and the Ministry of Economic Development into one Ministry of Business, Innovation, and Employment. This has set the tone for the function of the former Department of Labour to become more business orientated with the stated aim that “The purpose of MBIE is to be a catalyst for a high-performing economy to ensure New Zealand’s lasting prosperity and wellbeing…. We are working to support the government’s Business Growth Agenda.” The false idea of the prosperity of business being synonymous with lasting prosperity has been pushed by this government. But there has been no increased prosperity for ordinary people. Lastly, the government is now in the process of passing legislation that will enable employers to declare that bargaining is frustrated and they will not be required to conclude bargaining. This is essentially removing the right of workers to a collective agreement. The International Labor Organisation (ILO) says the proposed legislation would contravene their principles. There has been a huge amount of union submissions so far, but the government announced in December 2013 that it is proceeding to the second reading regardless. The main form of opposition to the changes has consisted of public rallies held after work hours, stopwork meetings, and legal action to secure the best possible interpretations of the changes. On some occasions union leaders made bold statements about mounting a more serious opposition, in 2010 for example one union leader said there would be “chaos in the factories” if the extension of the 90-day legislation to all workplaces came to pass. Unfortunately this sentiment was short-lived and the leaderships continue to be conservative on the question of strikes. Clearly these new laws need to be challenged with industrial action. Public rallies held after hours and brief stop work meetings do not sufficiently impact on the employers profits and should be seen at best as a starting point to build towards more generalised forms of strike action. The role of socialists is to establish an organisation with the type of authority in the working class from which we can competently argue such basics. The problem is not one of union resources or worker apathy. The problem is political, that unions have in large part become wedded to pro-market and capitalist ideas. The attachment of some unions to the Labour Party, which proposes no economic alternative to neo-liberalism, means that those unions don’t fight for a fundamental alternative to the system either. Without being tied to Labour’s politics, and by linking with other fighting organisations, these unions could play an exciting part in producing deep social change. An increasing number of union and left activists have become de facto apologists for the conservative perspective in the bureaucracy by arguing that the economic conditions are not right for strikes or that there is not the right attitude amongst workers. Others say there are too few resources or not the right information. The truth is that most unions have plenty of resources and most workers respond well to campaigns that will improve their work conditions and living standards. The problem is purely political. The bulk of union leaders today do not adhere to an alternative to capitalism. Such an alternative is the only thing that can provide relief and the necessary changes for working people. What we need most is a new type of politics to dominate the union movement. This means a return to socialist ideas which provide a genuine political and economic alternative to the profit driven system. When people have a vision for a better type of society this translates into a more fighting attitude on the ground. Therefore the task of rebuilding the union movement along fighting lines will be best done in combination with the tasks of building a serious socialist political organisation as well as a new workers party that can challenge Labour’s grip. These ideas will get the best reception from those who have the most to gain – the union rank and file. During the last upturn, the employers sought to increase profitability by placing emphasis on increasing absolute surplus value. For example, in 2004 workers in New Zealand were working longer hours than in any OECD country except Japan. In more recent times however employers are now seeking to increase surplus value by further rationalising and flexibilising the labour process. In particular, the employers in the traditionally unionised sectors want access to the flexibility and casualisation that exists in other sectors. This is what was behind the 2012 attacks on the conditions of meat workers throughout the country. It is also what is behind the attacks on port workers in Auckland – an ongoing situation where there is currently something of a stalemate. The link between profitability and the recent attacks on meat workers shows the way in which the employers want to offload their profit woes on to workers. Beef and sheep still account for over 15% of New Zealand exports. The Ministry of Agriculture and Forestry has stated that there have been profitability difficulties in the industry since at least 2009. In fact profitability issues for the meat sector go back decades, hence the decline in beef and sheep farming and exports. The locking out of over 100 CMP company meat workers in the Manawatu area from late October 2011 to late December 2012 was followed by the locking out of over 800 AFFCO workers in several meat processing plants for more than three months in 2012. The lockouts represented a new level of employer hostility in that the lockouts weren’t started as retaliation to union-led industrial activity but were started to attempt to force union workers to accept deep cutbacks. Talleys purchased the AFFCO plants in 2011 and were demanding more flexibility in the workplace. The company’s demand for greater flexibility was connected to its requirement for more control over the workplace. Greater flexibility is then imposed and used to increase exploitation and therefore squeeze more profits out of the workforce. Many AFFCO plants are now antiquated. Instead of resolving efficiency problems through investing in plant and machinery to create state of the art workplaces, New Zealand capitalists have focussed on making the workforce leaner, making it work harder and faster. At the Ports of Auckland Limited the employer attacks against the wharfies (stevedores), including lockouts, have been fundamentally about trying to reduce the conditions and power of workers in traditional union jobs and force them down to the flexibilised conditions of the broader workforce in New Zealand. Essentially employers are now going after core industrial workers in an attempt to make those workers subject to the neo-liberal workplace conditions of job insecurity, work insecurity (less guaranteed hours of work), income insecurity, individualisation of bonuses and benefits and other elements of the neo-liberal work environment. When other parts of the workforce are unorganised and working in these conditions then the core workforce is more vulnerable to the types of attacks that are happening now. In the stalemate at the Ports of Auckland the Maritime Union employment agreement has expired and the employer has attempted to gain traction for a scab union. This dispute needs to be seen as a wake-up call to the union movement. A setback for one of the most well paid and highly organised sections of the working class is a setback for all workers. Care workers have also been struggling over the last two to three years with strike action taking place at the workplaces one of the country’s largest rest home companies. Additionally, in this period, the Service and Food Workers union has won an important legal decision which held that overnight stays must be compensated at the minimum wage. Unite Union has continued to progress and build amongst fast-food and cinema workers, and this included a long round of strikes and other actions at McDonald’s outlets throughout the country. As always the key demands of Unite members have been around secure work and guaranteed hours. Service sector struggles are connected with the struggles of workers in traditional union jobs. The service sector campaigns are generally offensive campaigns against already existing casualisation and flexibilisation. The struggles at the ports and in the meat works were defensive struggles against casualisation and flexibilisation which the bosses have sought to impose. In order to unify the struggles of the working class over the next period unions should adopt a general slogan along the lines of “Secure Work, Secure Hours, Living Wage”. Joint industrial action, across sectors, should be organised. This type of campaign would be the best way to win improvements to the minimum wage and give workers the confidence to challenge the existing anti-worker laws. A feature of some industrial disputes of late has been the unwillingness of union leaders to blockade or put ‘hard’ pickets on workplace entrances to defend against scabs and to stop the supply chain. This is a concerning trend apparent during a number of recent disputes. There have been some situations where there has been a systematic allowance of scabs through the gates and the normal operations and supply have continued. This is dramatically different to only seven and a half years ago when, in the National Distribution Union versus Progressive Enterprises dispute, key warehouses were systematically blockaded and flying pickets were established to stop the operation of make-shift dispatch centres with force. Similar tactics were used by other unions at the time. Socialists must fight for the restoration of militant tactics in the trade union movement. This is not a mere ideological point. With employers becoming more aggressive, militant industrial tactics are necessary.